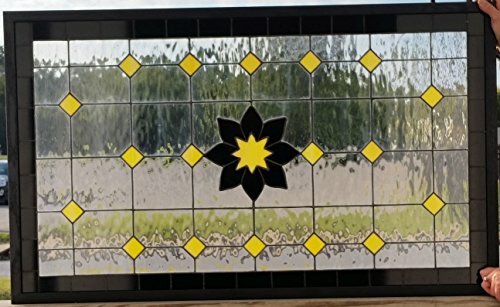 This simple but original stained glass window was created as a very different version of our "Stained Glass Window/ Hanging Panel- "Refined Arch" (P-22)" For her design, our customer asked us to use a particular center piece, which design was provided by her. Size is 24 ½ X 42. This can be ordered in any sizes and color that compliment you decor. Contact us to begin your custom project today!!"